waiting for them to warm my heart. But, so far, I feel the same. In a second the woman had to decide. Do I tell the truth? Do I wait so that it can unfold as we planned? Probably I will forget everything leading up to the story. But I’m quite certain I will not forget the story. At least for a while. I’ll probably forget the stomach virus that set in on Good Friday. And how I thought I might have been chosen by Jesus for stigmata because it felt like I was dying. And how I cancelled all of our guests for Easter Sunday because I didn’t want to pass on any germs and anyway I thought I might possibly be in the ER. And how I debated on cancelling because that meant we would have no ham for our Easter Sunday dinner and where could I possibly find a ham as delicious as a Honey Baked ham on Good Friday? And how I spent all day Friday in bed or near the toilet. And how most of Saturday is a blur. And how I kicked myself for being such a procrastinator and not having anything for the kids’ Easter baskets. And how even though I still felt puny I rushed out at the last minute Saturday evening to buy a ham and supplies for the kids’ Easter baskets while you got the eggs ready for The Hunt. And how the kids hate it when I call it The Hunt because it sounds like Hunger Games. And that I’m not sure what I’m supposed to call it if not The Hunt. And how I missed Easter Sunday mass in as many years as I can remember and I’m not sure if it was because I was sick or because I’m not sure I am a believer anymore – of which I am not sure. All of that will probably be erased from my memory in a matter of months. But I hope I do not forget how perfectly the morning unfolded despite being sick in bed for two days beforehand. I don’t think I’ll forget when you looked across the table at me during dinner and gave me an odd look that I couldn’t quite read.. I think I will remember this. You started the story by saying it was an Easter Sunday about and then you hesitated because I don’t think you could remember how many years ago. Maybe because it’s been that long? Maybe because we’ve lived another lifetime since then? Anyway. I mumbled that It was about 15 years ago. And what followed was a story. More correctly our story. But, hearing it this time was different. So much time has passed. Some of the details have now grown fuzzy. My memory has probably chosen to block the most painful events. So much so that it almost sounded like someone else’s story. Regardless, of the facts that must be told to make the story whole, I am sure. We could not have children of our own, we adopted a baby boy who came to live with us three days after birth, we’d met his birthmother briefly at the adoption agency, we loved this baby as our own and with all our hearts, this baby of ours lived with us for two years, he became a member of our family and he met all of our friends, we celebrated a second Easter with this sweet baby and then his second birthday. We planned a wonderful future with this beautiful baby boy and we even planned on adopting another baby. And it was right after that, right after his second birthday, that we were told it was an illegal adoption. She waved my question away, adjusted her glasses and cleared her throat in a chuckling kind of way. You continued the story but I looked up to see that you’d begun to cry. But you persisted, determined to tell it all – at least as much of it that makes it a comprehensible story. Because how could we ever express it all, right? By this time the kids had stopped eating. I knew then that it would hit the boy the hardest. He’d already teared up and mumbled that this was too sad. But, there was really no way to stop and once you start to tell the story you have to finish or nothing will make sense. So, you continued. Remember the story in the bible about King Soloman and the women who both claim the baby is theirs? The real mother cannot bear to see her baby cut in half so she agrees to give the baby to the other woman. King Soloman then declares that the woman who agrees to give up her baby is the real mother. Sometimes real life is more complicated than a bible story. You told about how after much agonizing reflection and thought we decided the baby had to go back to his birthmom because she loved him very much and had, in fact, changed her mind about giving him up seconds after having him and had been fighting all this time to try and get him back. I remember how I used to wear a cross around my neck at that time. Sometimes the grief would overpower me so suddenly and overwhelmingly my eyes would flood with tears and I would be unable to function. I would grip the cross and begin to say the rosary in my head so that I couldn’t think of anything else. After a few seconds a blanket of calm would surround me. My vision would come back. I could open my eyes and continue with what I was doing. Was this faith? You told our children about how sometimes you have to do the right thing even though it threatens to rip your heart out. You explained that sometimes things do not go the way we’ve planned. You explained that we went through a painful arduous process of giving this sweet baby, our sweet baby that we loved so much back to his birthmom who also loved him dearly. And that she raised the boy after that. You told them that we got to see the boy on weekends and he was still a huge part of our life. You explained how their family became like close relatives or childhood friends. You explained that we still see this “baby” boy that was ours. I remember just months ago seeing this 15 year old “baby” boy and thinking Where has the time gone? Who is this young man in front of me? Somewhere in that face I could still see the face of the baby that I knew from the time he was days old. Then you told them who this boy was. And then the story became whole. They realized that this baby boy is their good friend who they love very much. I could see from the looks on their faces that finally it all made sense. Why we have so many photos of him. Why he comes to visit us. Why we have a baby book that belongs to him. Why they have thought that he’s related to them. Why they’ve even asked if he’s their brother. It all made sense to them. Finally. I think I will also remember how even though everyone was crying then, minutes later everyone was laughing again and eating Easter cake and talking about how great it was that we were a family of six now. And how this story kind of made the circle complete. I think I’ll remember that the boy said, “So I almost had a brother?” with his face full of tears. I think I’ll remember how the girl said, “That’s really sad, but it’s happy too and that’s the best kind of story.” I think I’ll remember how they all hunted Easter eggs after that. Going forward the stories will be told in full. There is no need to rephrase, to couch, to explain carefully. The sometime story is the now story. And it is being written as we go along. And I do not immediately recognize the feeling as grief. It has been gone for so long. Yet suddenly and without warning it is back. I have tears in my eyes and my heart is breaking. You smell like boy sweat even though you have told me that you showered. I think you lied. I agree to snuggle with you in your bed because you are nine and I know that these moments are going to end soon. I am really sleepy and as I am drifting off to sleep I have a somewhat misplaced thought. I am thinking of a high school teacher that I had. I think she died of cancer, she was part of the Historical Society, and that she always wore dresses. But I can’t remember her name. For a moment I am irrationally obsessed. Then I think of mom. I think that if she were alive, I would call her up tomorrow. I would ask her the name of this teacher. As quickly as I was obsessed with remembering some seemingly insignificant name, I am overwhelmingly distressed over not being able to call up my dead mother. Particularly distressful is that I know precisely how our conversation would unfold. I play the tape in my mind. Hello, sweetie. It has been two years since I have heard her voice? I am struck that I cannot remember exactly how long. Has it been three? It occurs to me that after the first 365 days of being without mom I have literally stopped counting. And yet I can hear the voice so clearly in my ear. It’s me. Then we would exchange small talk. How is the weather there? Hot. Yeah, it’s hot here, too. Then I would say Ma, remember that high school teacher I had? She always wore dresses, and spoke with a lisp. She was in the Historical Society. She would say Oh, you must mean Ms. So-and-s0. Yes. I would say. The world being put right for some trivial reason that matters to no one in particular. Why were you thinking about her? Did she die of cancer? Yes, honey. Don’t you remember she had that long battle with breast cancer, then when she died her husband was devastated? They had just bought that house out in the country? Oh, yeah. Now I do remember. Whether I actually do remember or not being totally insignificant. It is more the needing her that matters so much to me. And insanely just knowing that Ms. So-and-so did die of cancer, her husband devastated has brought me peace. I am deeply jolted by these thoughts of mom and I open my eyes to get my bearings. I look over at you and tussle your hair gently. I want to talk to you. Your eyes are closed, your breathing heavy, and I am sure you are asleep. I want to wake you because selfishly I do not want to be alone with what I know now to be my grief. I consider it. As if you have heard my thoughts you say What? with your eyes still closed. I say simply and immediately knowing that you will understand, I miss Grammy. Since you were born I call my own mother Grammy. It just makes sense. Me, too. You say simply. What do you miss? I miss that I used to call her when I didn’t remember things and she would tell me the things that I didn’t remember. Mmm. You say. I know that you have no idea what I mean. Do you mean that Grammy knew everything? Yes. I know that as an answer this is completely inadequate, but I have nothing else to offer. You consider this and accept it within seconds. Well, you say in your attempt at a solution, I guess you could call Aunt Lucy. She’s old. I laugh and it is good for my heart. And even though it is funny and it is a nine year old’s offering for a peaceful heart, after I am done laughing my soul is bare. Again. No, I don’t think she would know the things that I don’t remember. Well, what about Grandpy? He would know everything that Grammy knew, right? Yeah, buddy. I think he would. And to myself I say, But it’s not the same. And immediately I feel guilty for having that thought. We are quiet for a long time and I think that you have drifted back off to sleep, but suddenly you say, Mom, didn’t you tell me that your Grandpy died when he was 107? Again, I giggle and it does feel good. He was old, but not 107. Can you tell me about him, ma? Well, we used to go visit him and my dad’s mom every Sunday. They lived close to where we used to live. They had a two-story house, but the upstairs just had one room. I think. There was a box of toys up there and I would play while the adults talked downstairs. They spoke Spanish and I couldn’t understand a lot of what they were saying, so I just played upstairs. I ramble on and tell you about the tattoos of the Virgin Mary, Jesus on the cross, my grandma’s name in a heart with an arrow. As I relate these memories I am not sure that they are true. But I don’t think that it matters. I tell you about how my Grammy was as deaf as a doornail and spoke no English, but how somehow I felt love for her. You ask me about the size of my Grandpy’s sweet tooth and I tell you that it was huge. Possibly larger than your own Grandpy’s sweet tooth. We both laugh. We are quiet for a long time. I am sure that you have now drifted off to sleep. I lie there alone with my grief. And again, you surprise me. I love you, mom. And I miss Grammy, too. And I hope that my Grandpy lives to be 107. Rinse the lemon, then peel it. Combine 1/2 cup of water and sugar in a saucepan. Stir until the mixture comes to a boil and the sugar has dissolved. Add the lemon peel and let simmer for five minutes. Let it cool and strain to remove the lemon peel. Refrigerate until chilled. Add the yogurt and honey to the chilled syrup and stir until combined. Put a bit of the mixture into your molds, add the berries, and then add the rest of your mixture to the molds. Freeze until firm. Results: Yummy flavor that three of my four kiddos liked. I loved it. I used Stonefield plain yogurt which is not Greek and I used blueberries. Other than that I followed the recipe. Unfortunately, my popsicle mold sticks did not stick to the paletas, so I ended up having to spoon/break the paleta out of the mold. That part was bad, but the flavor was still good. I think it was a result of not having filled the molds all the way to the top. I am not going to be able to be in the kitchen for a few days, but here’s what I am dying to try – well, three things. One: I’d like to try this recipe again and I think a GREAT compliment to this dish would be a really crisp ginger snap. So, I would like to make a paleta sandwich with the filling being what is above (not quite as frozen) and the cookie being a gingersnap. Two: Balsamic Strawberry Pops (for which I have a recipe and will let you know how that goes), and Three: Any Pops With Liquor! If you have some great recipes – send them my way! 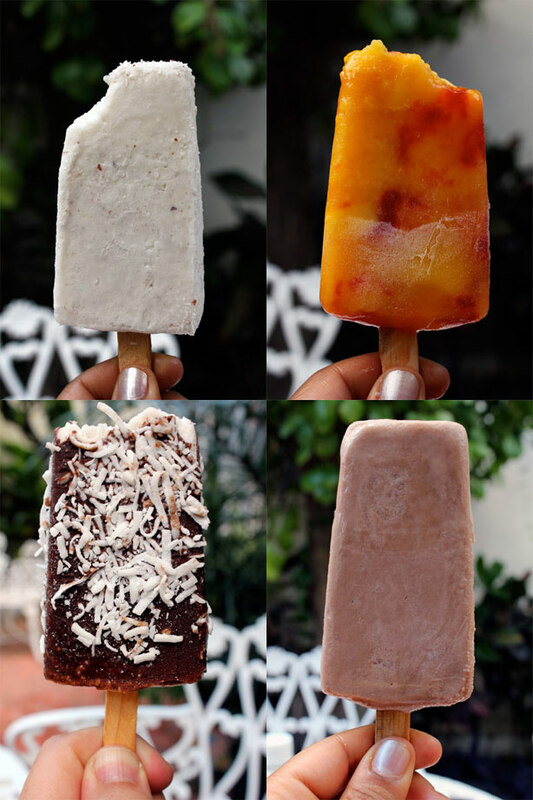 Hope you are staying cool this summer and eating some delicious treats. Can you believe I made this? So, those of you who know me well know that I am a foodie, but not necessarily a great cook or baker. Since I am a mediocre cook/baker I often do crazy things that refined cooks know not to do. Like….try out brand spankin’ new (often complicated and far above my skill level) dishes I have never cooked before at parties. (Hubby loves it when I do that). Something you should also know about me is that when I cook I must follow a recipe to a tee (Even if this means that my oven is hotter than the oven of the cook who wrote the recipe and I burn the entire dinner or dessert. And, yes, hubby loves that, too). Now, that being said, I will take you back to last Saturday when it was…oldest girl child’s First Communion dinner/lunch. I was pretty sure I could manage her request of lasagna with salad for “linner”, but her dessert request was a little more tricky. She requested lemon cake. Huh? Lemon cake? After thoroughly questioning her: Lemon? The tiny, yellow things? Are you sure you like them? They smell like floor cleaner? They are typically used in lemonade? What about chocolate? I thought you liked chocolate? It was clear she did indeed want lemon cake. So, being the great mom that I am <insert sarcasm> I frantically started to google “lemon cake” the night before her party at around 9:00 p.m.
With recipe in hand, I began my Making of the Lemon First Communion Cake. It’s titled like a novel because that’s kind of what it turned into in terms of time, research, trial runs, do-overs, running it by various “experts,” etc. I can trace my downfall back to my desire to modify the original recipe by putting it into a 9 x 13 pan rather than two round 8 inch cake pans. Bakers of my skill level should never stray from the original recipe. That’s how (at about 9:40 p.m.) I came out with a cake that smelled like……bleach and was about one inch high. 9:42 p.m. – I was starting to panic. 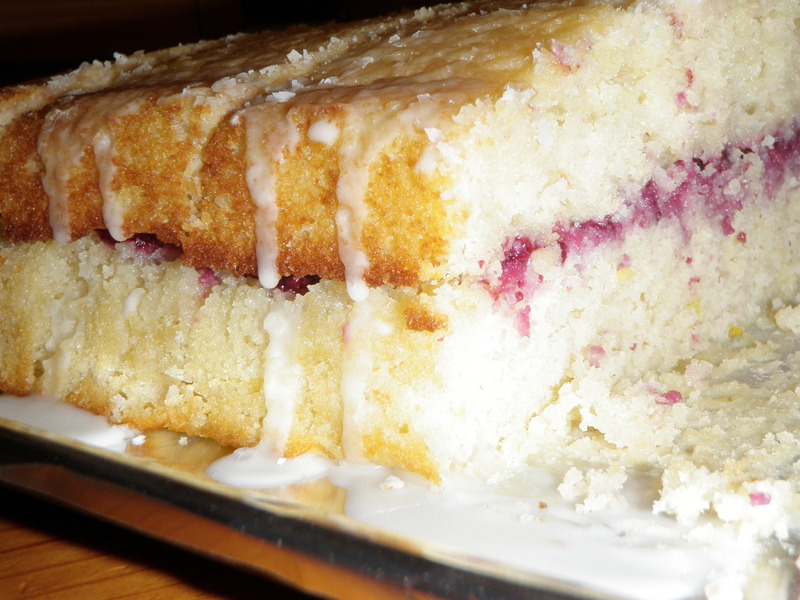 So, I did what I always do when I am panicking – I googled lemon cake……..again. I was really worried about the size of the cake and the smell of the cake. After much indecisiveness and turmoil I decided to bake the exact same cake again with less lemon (to cut the bleach smell). That’s how I ended up with two one inch 9 x 13 decisively lemony cakes. Now, I’m no dummy and therefore while I was baking the second cake I realized I would need a way to put the two thin cakes together. So, back to google where I found this delightful blog and cake recipe with a delicious looking filling. http://calminthekitchen.blogspot.com/2009/02/lemon-cake-with-berry-filling-and-lemon.html I could tell by the picture alone that this cake was WAY above my skill level. But, I thought I could manage the filling. Problem: I only had strawberries. So, I used fresh strawberries for the filling. I managed to “turn my cakes out” and put the filling in the middle. THEN I managed to make a yummy glaze for the top by modifying the recipe for glaze above with milk instead of butter and a little less lemon. Now, my hubby is a fantastic cook and fairly great baker, too. He is my polar opposite when it comes to cooking, so I consulted him many times during this process (mostly he just kept saying, “Are you STILL making the cake? How many are you making? You do know the party is tomorrow, right?”). When the finished product was sitting on the table (round about midnight), he reminded me that good cooks always taste their food before serving it. Which leads me to a question I am still not sure I have a good answer to: How do you do that with a CAKE? Serve a cake at the party with a piece taken out of it? That just doesn’t seem polite. So, I served the cake the next day. Untasted. I had no idea whether it would be a huge hit or an utter disaster. Ironically I was confident in the fact that I am familiar with utter disasters! BUT, to my pleasant surprise it was a HUGE hit. It was lemony, rich, had a texture of tres leches cake, everyone (especially my sweet baby girl) loved it, and the fruit in the middle was a lovely touch. I even took a picture of it so everyone would believe that I actually made it. And the fact that photographing food to actually look edible? Yeah, that’s another post. If you are lucky, I will make it again for you someday on your special day. And the time that I have spent away from you melts away like snow in hot sun when I hear your first words on the phone. As I chatter incessantly and you “uh-huh,” and “yeah,” and reminisce to pacify my irrational need for this – I am somehow calmed and soothed and lulled into an “I’m okay,” which is propelled forward by the ebb and flow of conversation. It is the time after we hang up that is the most difficult. It is the time that I am in my own house and you are somewhere in your own house that it is hard for me. It is then that I realize that the “I’m okay,” is only resting water and that at any moment it can be disturbed by any feeling that falls into it. It is then that my mind wanders to what could have been. I wonder what you will think about us when you are a grown man. I wonder what you already think of us. I wonder if you know who we are. Do we know you? I wonder if you pity us. I wonder if we pity you. So, I allow myself a few moments of thinking about how different things could have been. I fantasize about a life so different from my own that it is difficult to recognize myself or you. Then I stop. I go into my kids’ rooms and kiss them in their beds as they sleep. I ground myself with the life that I have. Time heals all wounds. But then I am not sure. How much time? How deep the wounds?